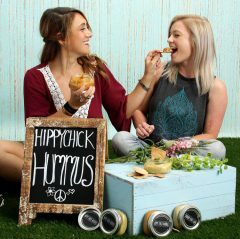 Hippy Chick Hummus is a small plant-based cafe + local kombucha bar located in the heart of Downtown Frederick, MD. We also sell our hummus to a few local grocers and breweries which can be found on our “Retailers” section of this website. Hippy Chick Hummus was first established as a brand of hummus at the Frederick City Farmer’s Market in May of 2016. By July 2016, we were at several Frederick County markets, events and traveling all over the place selling delicious varieties of hummus. And the demand just kept growing and growing. Once the markets ended, we landed our first wholesale opportunity when Firestone’s Market began selling our hummus. Erika and Zack at Hippy Chick Hummus the day Erika signed the lease. Once it was realized that there was a serious lack of fast, healthy vegan food in Frederick, owner Erika Brown knew that Hippy Chick needed a home and that it had to be downtown where it all began. Add in a little magic, perfect timing, meeting one special contractor and Hippy Chick Hummus Cafe opened it’s doors on June 2, 2017 boasting fresh acai bowls, local kombucha on tap and of course- delicious hummus. As time progressed, we added more items to our menu and perfected the art of serving creative and beautiful foods made with love. Erika, a Frederick native, has been making hummus since she was a 19 year old waitress at the Mediterranean Grill. She continued to perfect her recipes in her tiny college kitchen and even in various hostels around the world. Everywhere she went, she brought the hummus. So when all other doors closed on her (aka: she was fired from every single job she’s ever had) she decided to just keep on doing what she had been doing and make a business of it. Thanks for visiting and we hope to see you soon at the shop!